The Small Group Leader Toolbox is a powerful tool to give Group Leaders access to the group members in order to communicate via email or Text Message (SMS), take attendance, view the attendance history of group members, and process group registrations. This features has thirteen pages, with some visible and some not visible in navigation. Start the Small Group Registrations Agent. 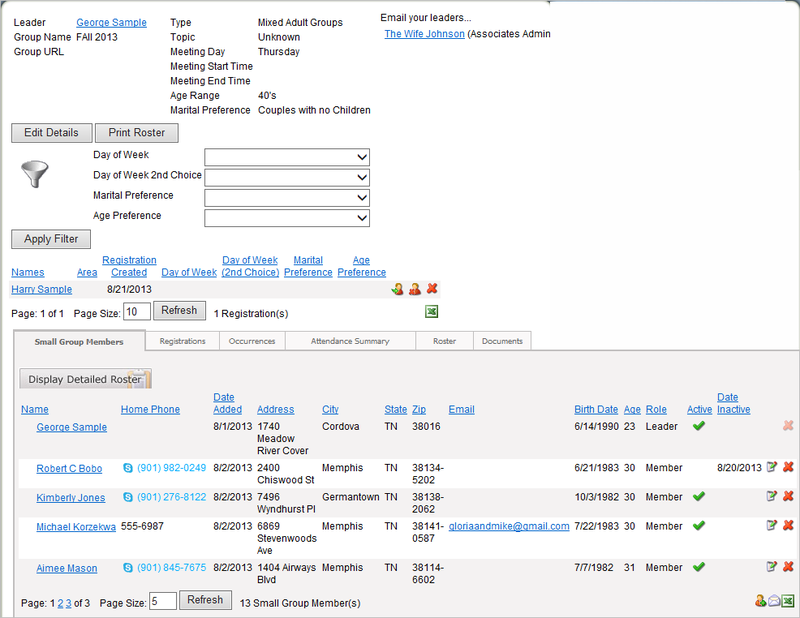 Customize the Group Leader Registration, Group Member Registration and Small Group Locator System Emails. Customize the Meeting Day, Small Group Topic, Marital Preference, and Age Range Lookups. Some Lookups are used in other features. Be sure all the Details of each group are complete, including an active Group Leader and the Location. Be sure the addresses of Group Leaders are geocoded for home groups for the purpose of Arena accurately identifying Groups when proximity is used. Customize the Group Locator Email Organization Setting. Group Leader Toolbox page – This page displays the details of the group or groups the user is a leader of, and allows the user to select a specific group. This page should be located in a secure area of your website, and should be visible in navigation (or linked to by a hardcoded link). This page requires the Group List module with Public Site set to true, the proper Category ID specified, and your View Small Groups page selected as your Group Detail Page setting. With the Public Site set to True, the tree view does not display. Add Member Request page – This page is for when the leader does not have permission to add members directly to the group. Instead, the Add Member Request page is a form the leader completes, and Arena sends an email to a designated email address (either a staff member or a volunteer) who then manually adds the member to that leader’s group. This page should be located as a child of your Group Leader Toolbox page, and should be visible in navigation, if using this method. This page requires the HTML Email Form module with the From and Recipient email addresses selected, the Instructions to be displayed at the top of the email entered, the email’s Subject line entered, and the HTML formatted form entered in the Details area of the module settings. View Small Groups page - Once a user selects a small group on the Group Leader Toolbox page, Arena directs them to the View Small Groups page where they can view and administer all of the details of the group. This page should be a child page of your Group Leader Toolbox page. It should not display in navigation and requires a specific group ID. Some settings are required, while others are optional. This page requires the Small Group Details module with Person Details page set and the Public Site set to True; the Pending Registrations module with the Registration Details page set and the Public Site set to True; and the Small Group Tab module with the Area Details, Default Occurrence Type ID, Occurrence Details page, your Registration Details page set, and the Public Site set to True. Review and customize the Small Group Tab Control module settings. Person Update page – This page displays if the leader does not have permission to edit a member’s Person Detail page directly. The person uses the Person Update page to make any changes. The pages link from the Person Details page by selecting it in the Person Details module settings. It should be a child page of your View Small Groups page and set to not display in navigation. This page requires the HTML Email Form page with the From and Recipient email addresses selected, the Instructions to be displayed at the top of the email entered, the email’s Subject line, and the HTML formatted form entered in the Details area of the module settings. Group Roster page – This page displays the Group Roster page with details such as their pictures, addresses, and phone numbers. This page should be a child page of your View Small Groups page and should not display in navigation. This page requires the Small Group Roster module and has no required module settings. Occurrence Detail page – This page displays the Occurrence Detail page. This page should be a child page of your View Small Groups page and should not display in navigation. This page requires the Occurrence Details module with the Public Site setting set to True and the Area Detail, Event Detail, Group Detail, Occurrence Type, and Profile Detail pages selected. Registration Details page (Self-hosted only) – This page displays a registrant’s selection(s) and the leader can assign them to the group. This page should be a child page of your View Small Groups page and should be set to not display in navigation, as it requires a registration ID be passed to it. This page requires the Registration Details module with your View Small Groups page selected as the Cluster page and the Area Details page selected. Area Details page – This page displays geographic information about the group and its members. This page should be a child page of your Group Leader Toolbox page and should not display in navigation. 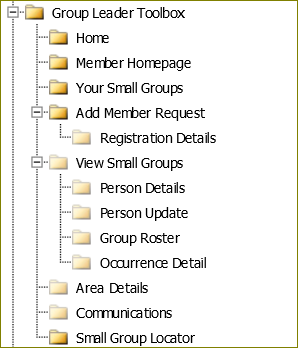 This page requires the Area Details module with your small group Category ID entered, external Person Details page selected, and your View Small Groups page selected as the Area List page. Communications – This page displays the Communications page where leaders can create email communications. This page should be a child page of your Group Leader Toolbox page and should not display in navigation. This page requires the Mail Merge module, and has no required settings. Home – As a child page of your Group Leader Toolbox page, use this page as a redirect to your website home page so members can easily navigate back to that page. This page requires the Redirect module with a page link to your home page. Member Homepage – Just like the Home page link above, the Member Homepage is also a redirect, this time to the Member Homepage for ease of navigation. This page requires the Redirect module with a page link to your Member Homepage. Your Small Groups – This page is a redirect back to the View Small Groups page. This page requires the Redirect module with a page link to your View Small Groups page specified in the module details. Small Group Locator – This page is a redirect to the Small Group Locator page, if you have chosen to implement this structure. This page requires the Redirect module with a page link to your Small Group Locator page specified in the module details. To allow Group Leaders to edit Group Role and Group Status, set View permissions for the Small Group List module. To add new group members, the leader needs permission to the Add Member Request form. From the Leader Toolbox page, Leaders can edit the details of the group, emails group members, take attendance, print a roster, process group registrants, and change the status of a group member.